Surprise parties, mystery boxes and lucky draws. What do all of these have in common? Of course the surprise or shock factor. Unfortunately I am in the minority; I really do not take surprises well. I think the last time I ever had a “surprise” something, it was during University tutorials and my friend would think it would be funny get the whole class (and the tutor) to hide and then jump out on me when I walked to the dark class room. Let’s say they will not be doing it again anytime soon unless they want permanent hearing damage. Sure it was my birthday and it did have good intentions but really save your energy. I do like the not knowing what is to come or being kept in the dark from information that could have a significant impact. Being surprised to me is like is almost as unenjoyable as sitting a university essay exam and probably would be as anxiety provoking too. This means that a lot of things are quite unpleasant to me especially since I do get scared easily( however I can watch SAW series without breaking sweat; weird I guess) This rules out first person shooter games, lucky draw type events, blind fold games and the odd surprise party. However there is one surprise that I could get used to is that when I try out a new recipe and it turn out to be brilliant. I love those surprises especially if I had low expectations of it or I was uneasy about how it looked before going in the oven. Trust me the first time I ever made a self-saucing pudding I thought I would have to throw out the whole dish because it would be a massive fail. While I still have anxieties about making a soufflé or pulling off the perfect deep fry, one food that has never failed me has to be cookies. What food or recipe have you been putting off making because you are unsure it will work? 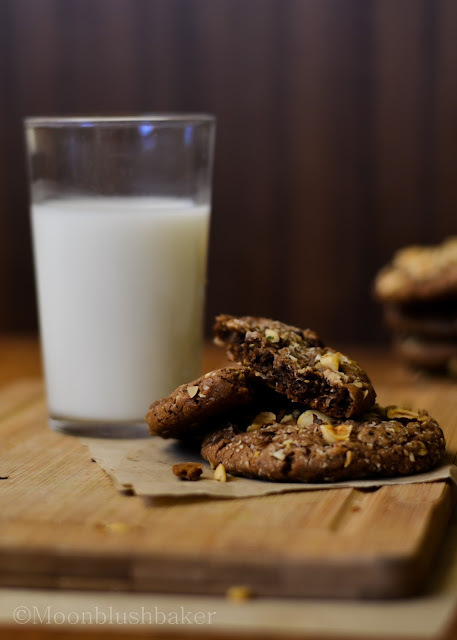 I normally prefer my oatmeal cookies crunchy, much like the ANZAC biscuits Australia is so popular for. However I have deviated from that path and decide to use a recipe from the newspaper. This is a recipe From Bill Granger a well-known chef and owner of Bill’s who specialises in modern Australian cooking. I absolutely adore his restaurant; if you ever get the chance to go there you must try the corn fritters. Oh my GOD! Heaven on a plate. He is also famous for his bakery goods, so I knew this recipe had to be good. 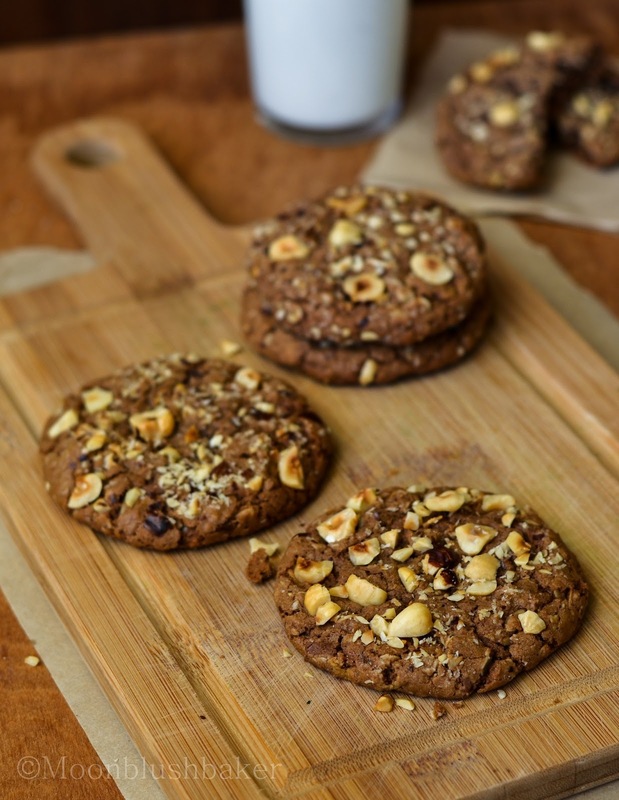 Now these are bakery style oatmeal cookies made adult by using hazelnut meal and nutella. Big, round and undeniably chewy because of the rolled oats; a sight of beauty if you ask me after a long day of running errands (yes even on holidays I need to do things. sign). 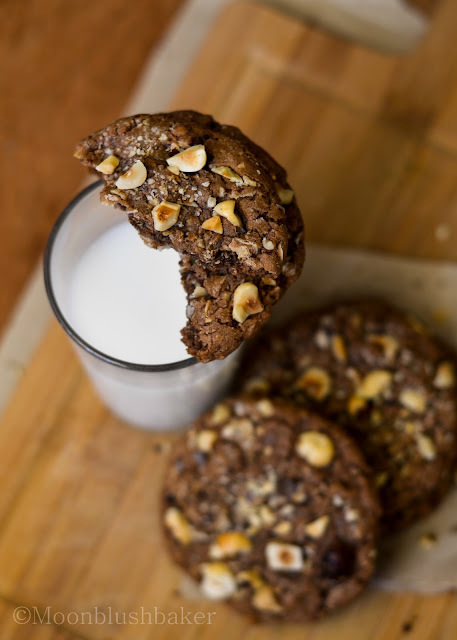 The best parts about these cookies are they really do taste like pure Nutella, only in a portable cookie. 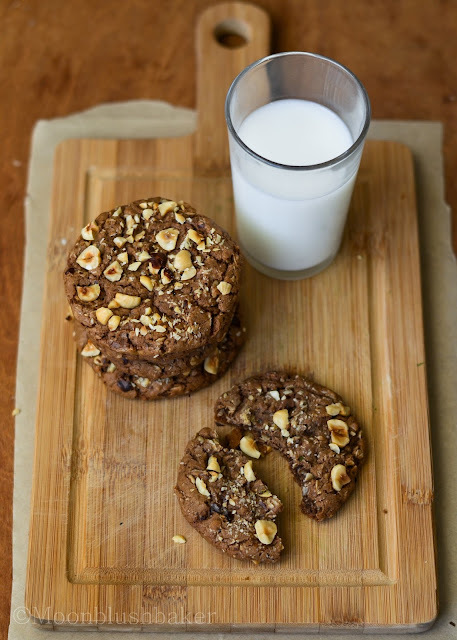 I think that is down to large percentage of it in the cookie and the addition of roasted salted hazelnuts. 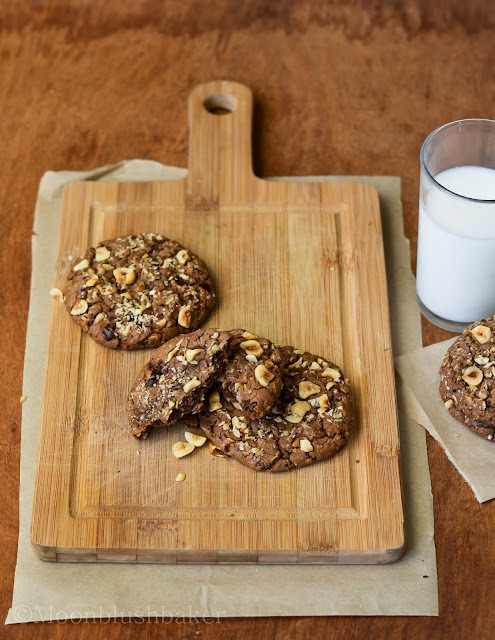 An added benefit of these cookies is that you get bang for your buck, they make 18 large cookies for minimal effort and everyday ingredients. Preheat oven to 180°C. Line two large baking trays with baking paper. Cream the butter with the sugar until light and fluffy. Beat in the egg and hazelnut extract, until fluffy again. Add the Nutella and milk, until the mixture is smooth. Stir in the flour, oats and bicarbonate of soda. Drop 4 generously heaped tablespoons of dough onto each baking tray, leaving at least 7cm space between each to allow for spreading. Roll the balls in the hazelnuts. Bake for 15-17 minutes, until dry-looking and covered with even cracks. Leave to cool and firm up on the baking trays for 2 minutes before carefully peeling away from the paper. Cool on a wire rack and serve. When the title begins with “giant” and “nutella” it’s going to be a good one! I have got to try these! ha ha those two words are made for each other aren’t they? Thank you for commenting! 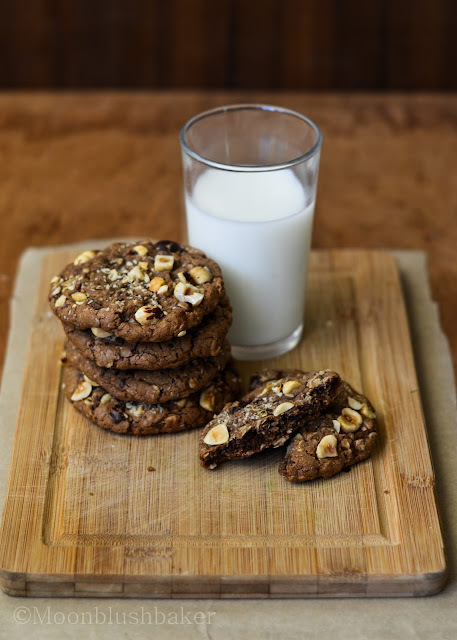 I love Nutella and have baked a few different cookies with it – but yours have all that great texture from the oats. So good I bet! OMG I WANT! These look amazingggg. I’ve been putting off trying to make macaroons because I’m just not sure if I can actually get the egg whites and everything to magically come together into those delicious little cookies! But I would definitely not put off making these because they look totally incredible! I’m putting these on my list for the next time I want to just INDULGE! Can can speak from experience do not fear the macaron! I believe you can do it. Once you get the folding down it is easy street^_^ Thanks for commenting! With the oatmeal, I’m justifying to myself that these cookies are somewhat healthy. Either way, I’m prepared to inhale the entire batch. Thanks for your comment love. I am the same – I usually like things that are predictable. 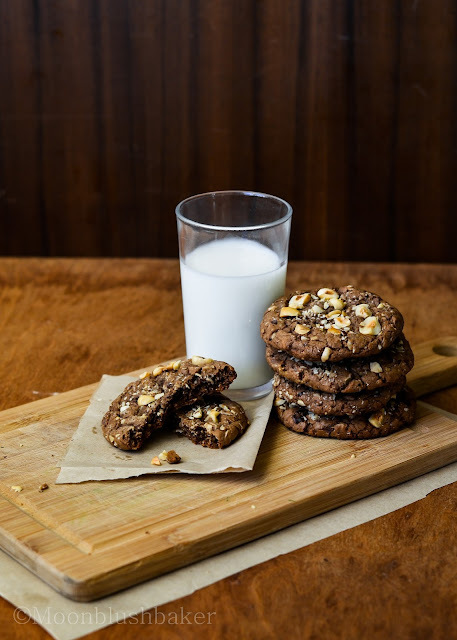 And these cookies – I want them! I am glad I am not the only one. My friends always tease me for it! 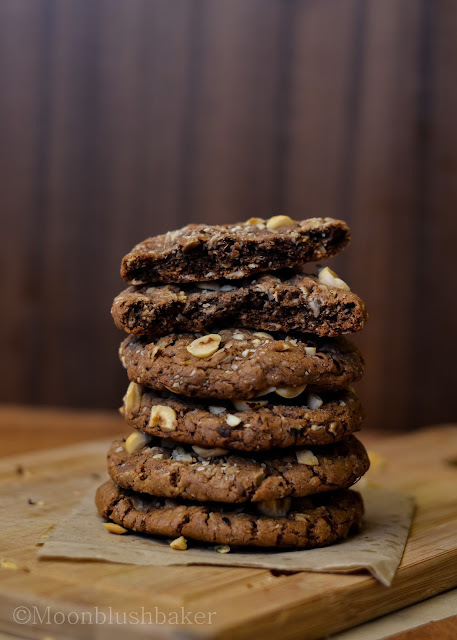 These cookies look so rich and moreish! Love that these have oats in! They look fabulous!